Located in West Lakes, the stadium serves as the home ground for both SA AFL clubs – Adelaide and Port Adelaide Football Clubs – and is also the administrative base for the South Australian National Football League. Originally named Football Park, the stadium was built in 1972. The stadium hosted its first football match on May 4, 1974, between Central District and North Adelaide. Barry Hearl from North Adelaide Kicked the first goal at Football Park, but Central won the clash by 30 points. 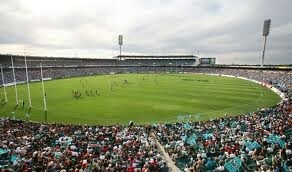 In terms of size, AAMI Stadium is the biggest sporting venue in South Australia. With 51,515 seats, the playing surface spans approximately two hectares and the distance from one end to the other is 165 metres. The surface – consists of 17 varieties of grass seeds, mainly rye and couch. AAMI Stadium does not only host football matches. Major artists, including ABBA, Dire Straits, U2, The Rolling Stones, Robbie Williams and Andre Rieu, have performed at the ground. The Stadium has also hosted international cricket matches and more recently, a Twenty20 charity match that raised money for Victorian bushfire survivors.